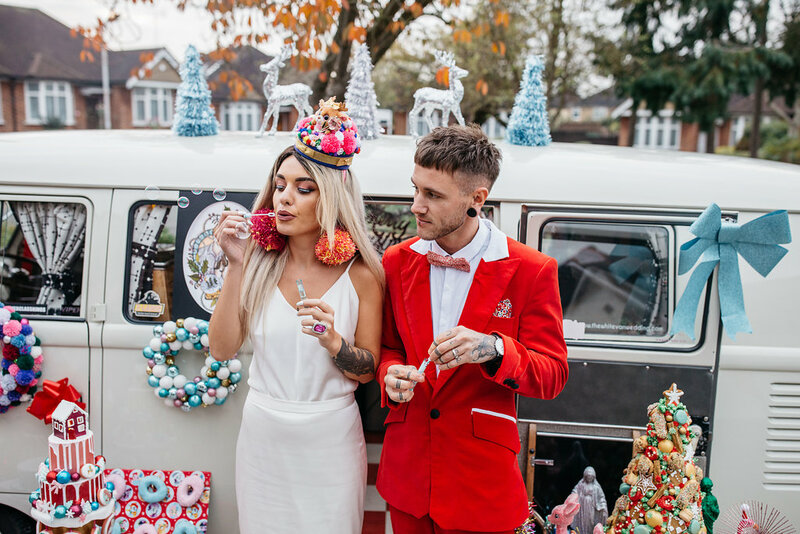 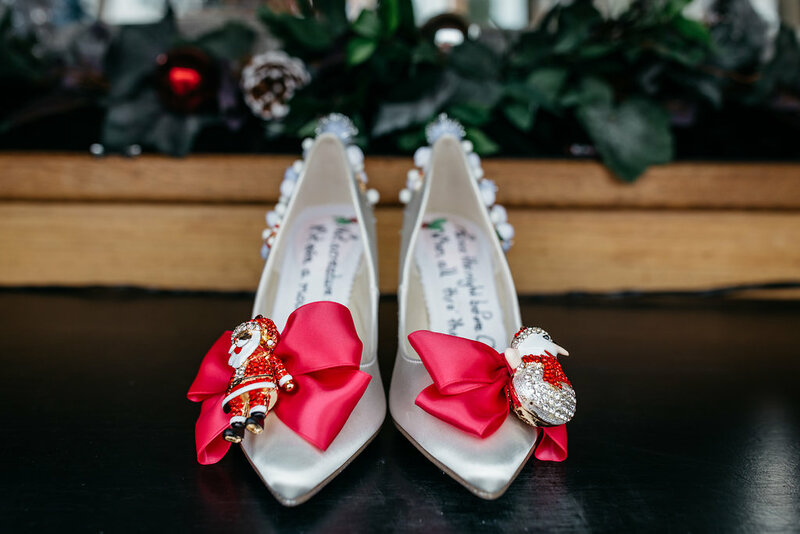 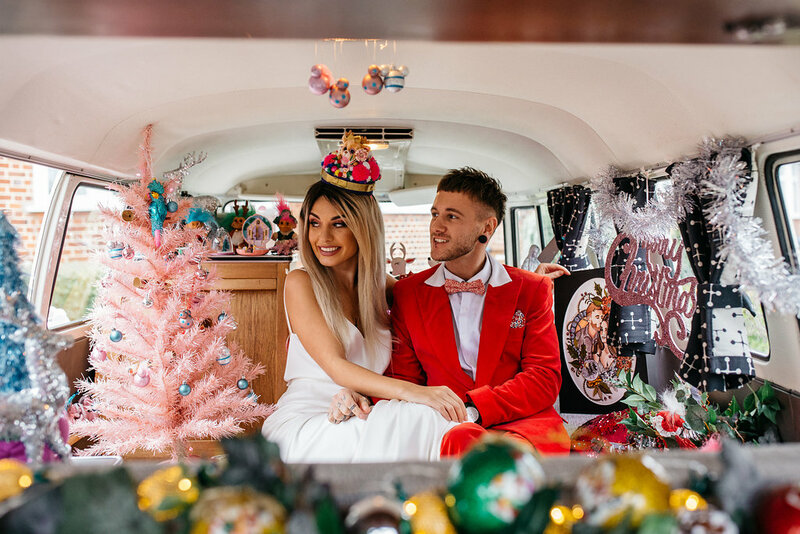 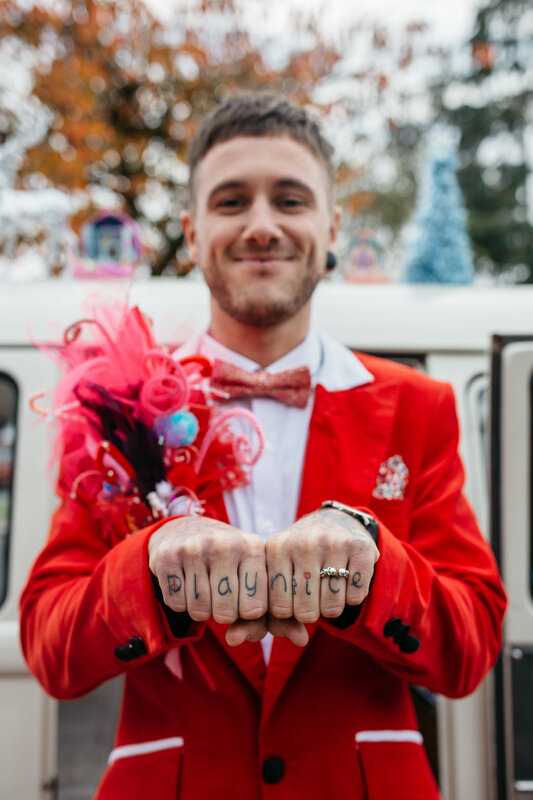 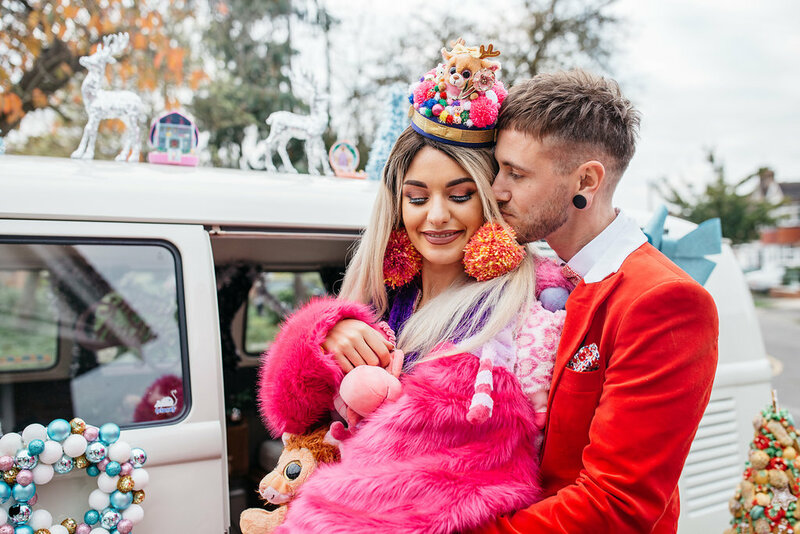 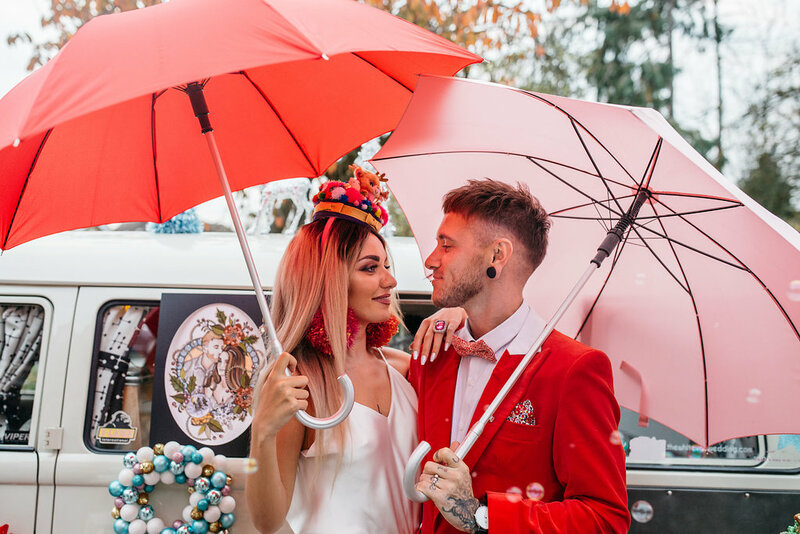 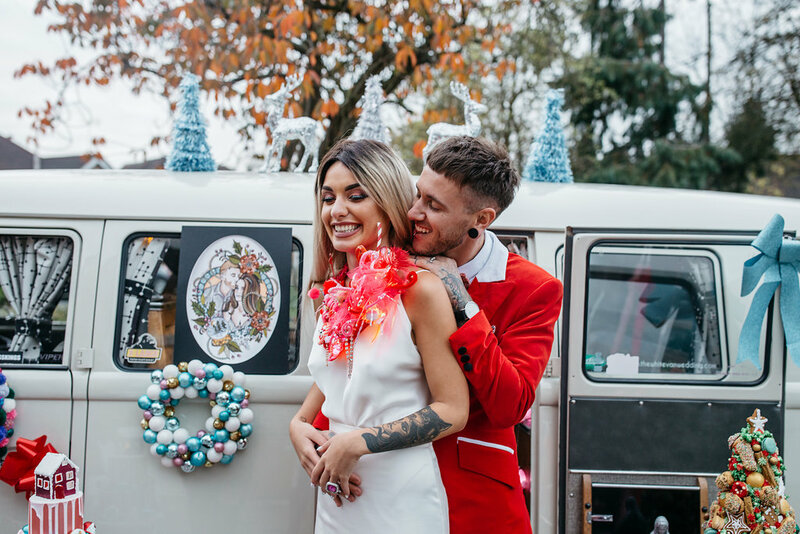 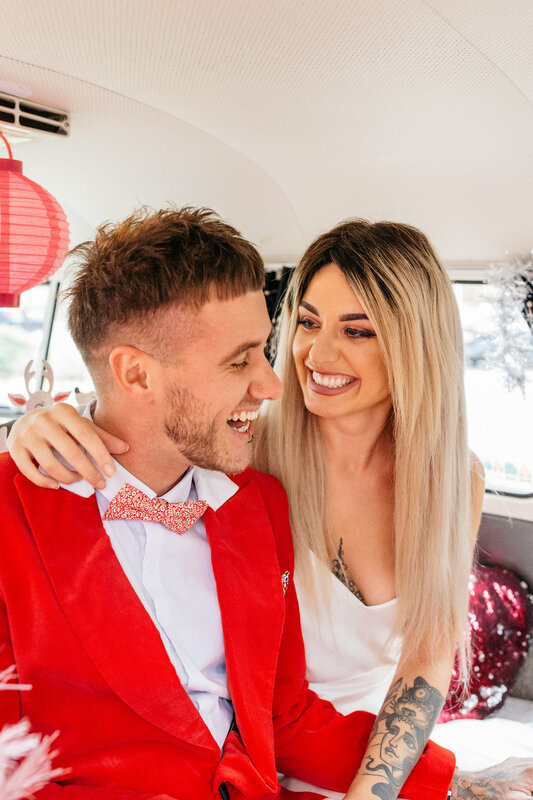 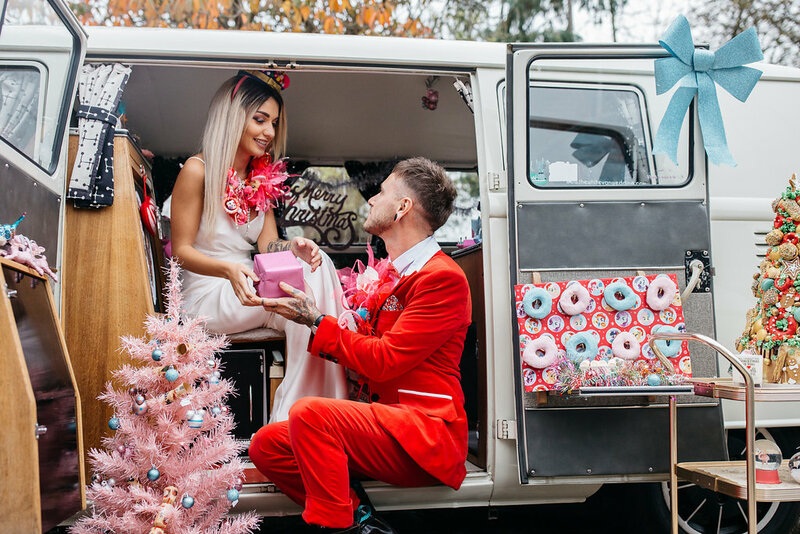 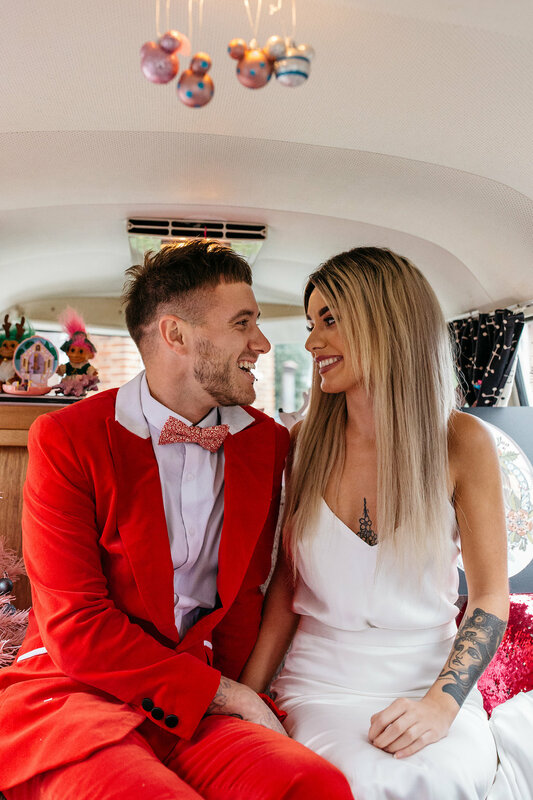 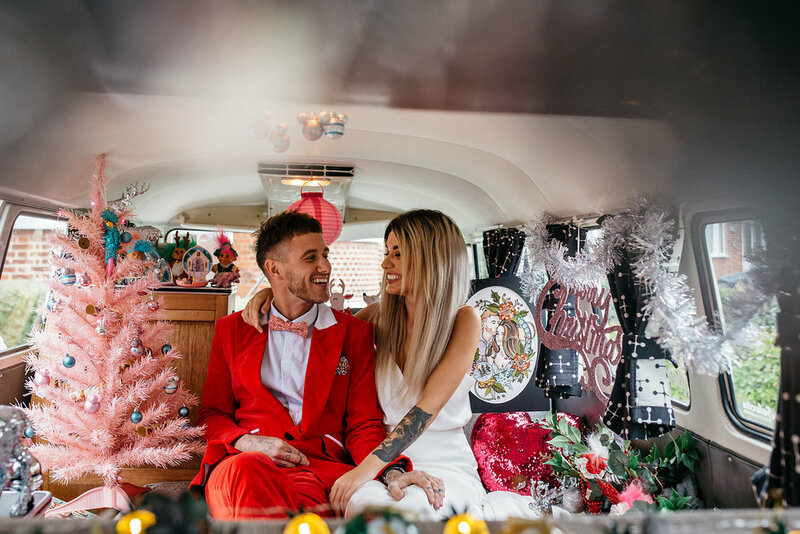 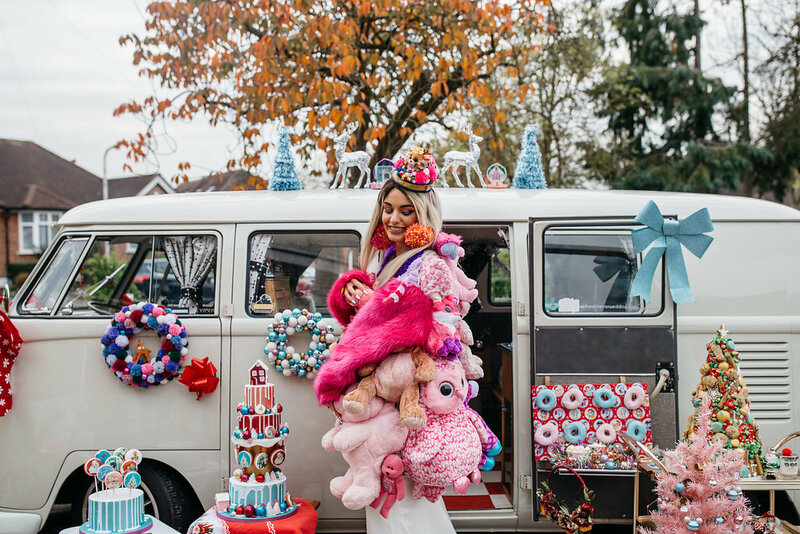 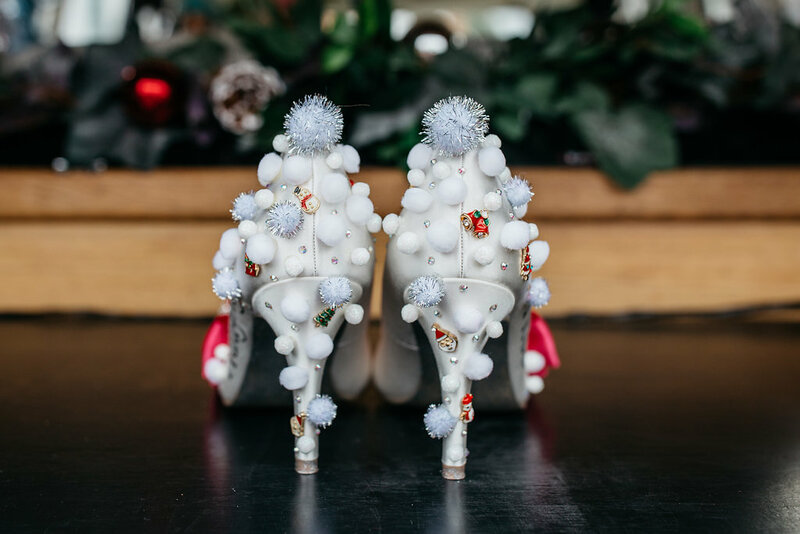 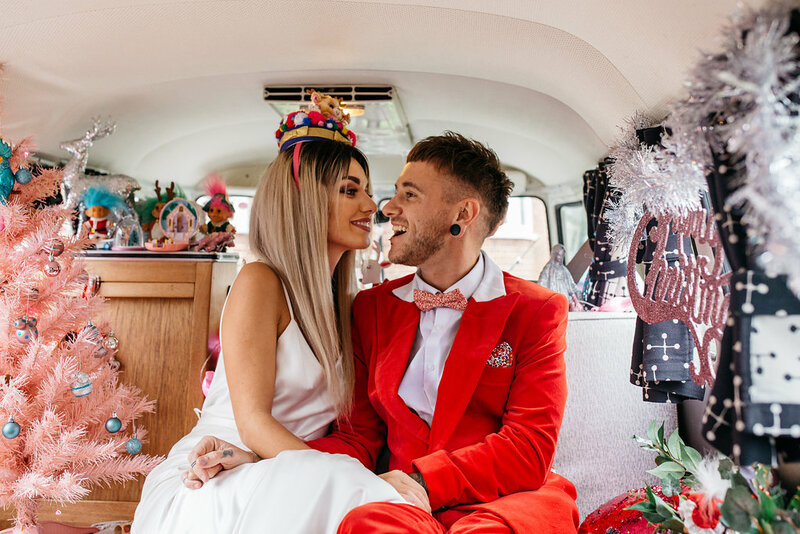 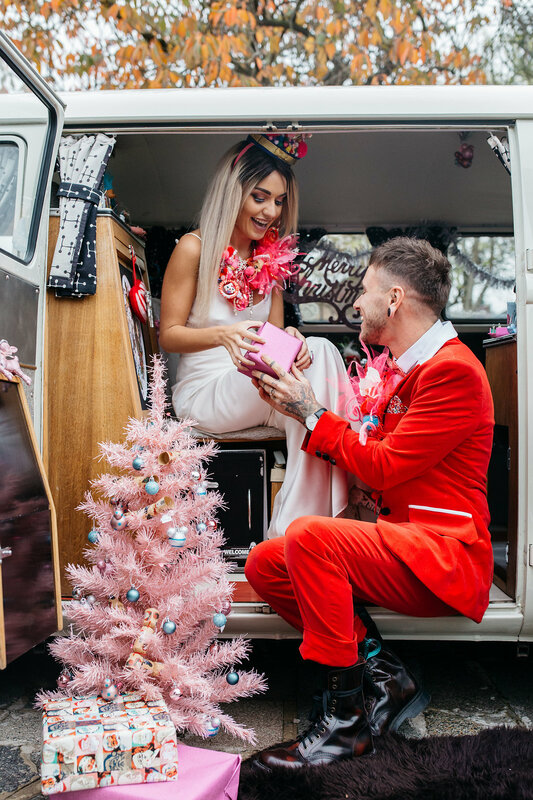 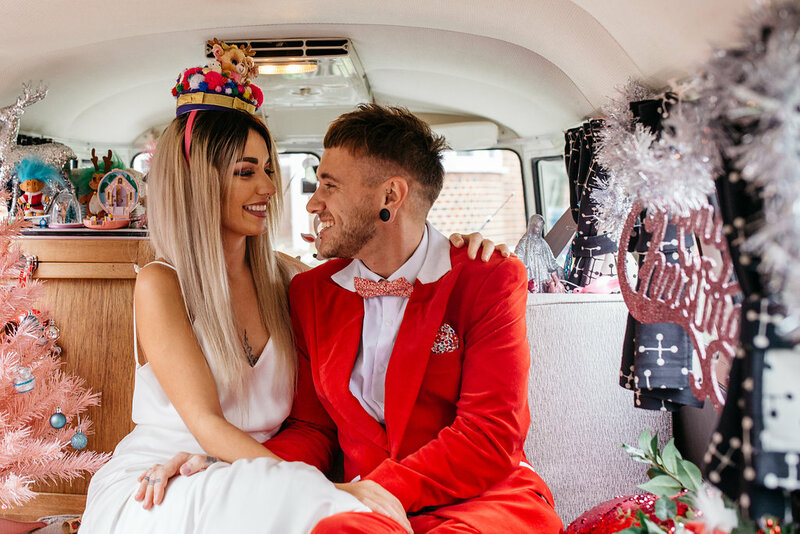 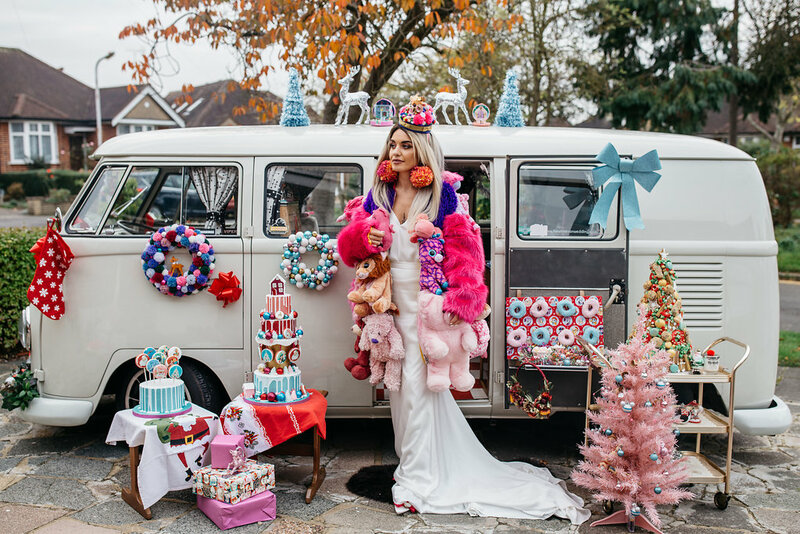 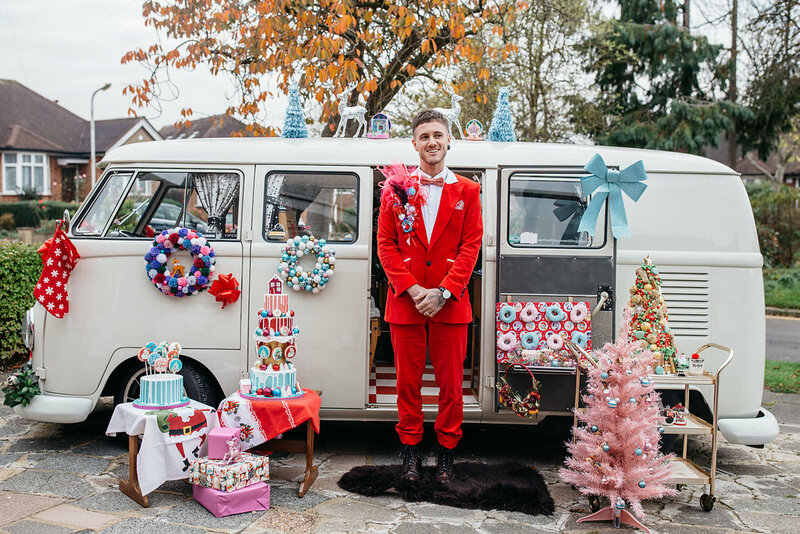 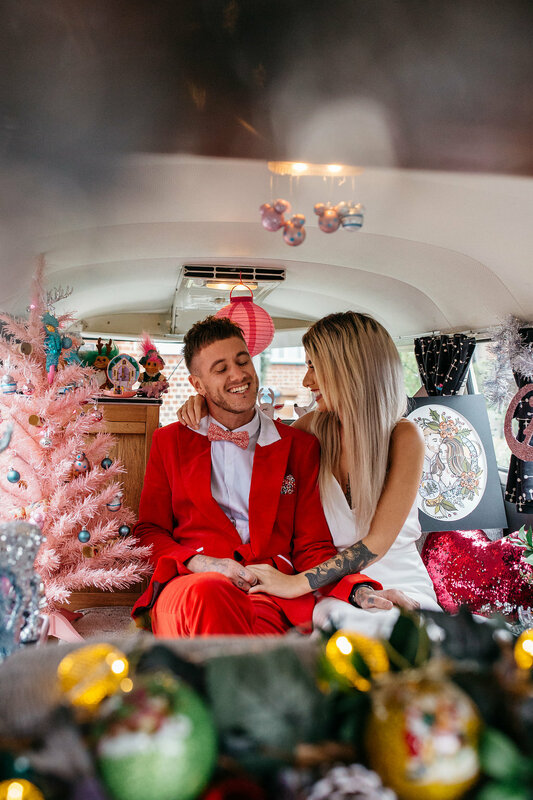 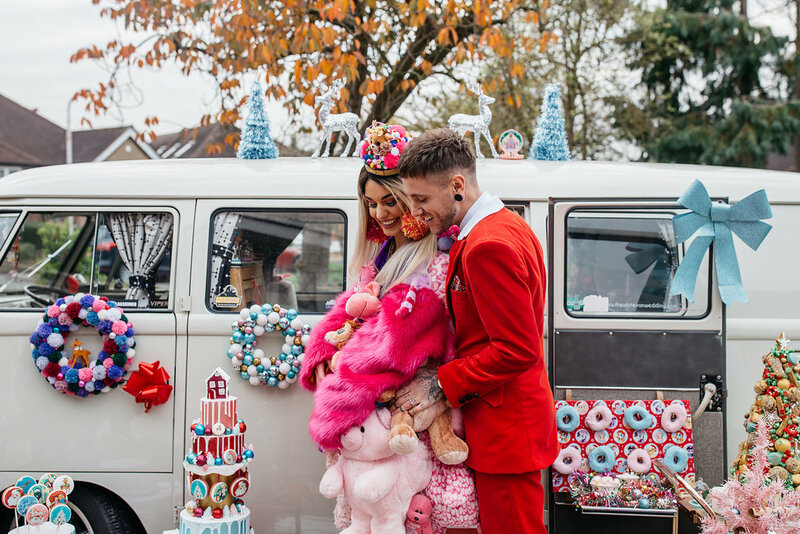 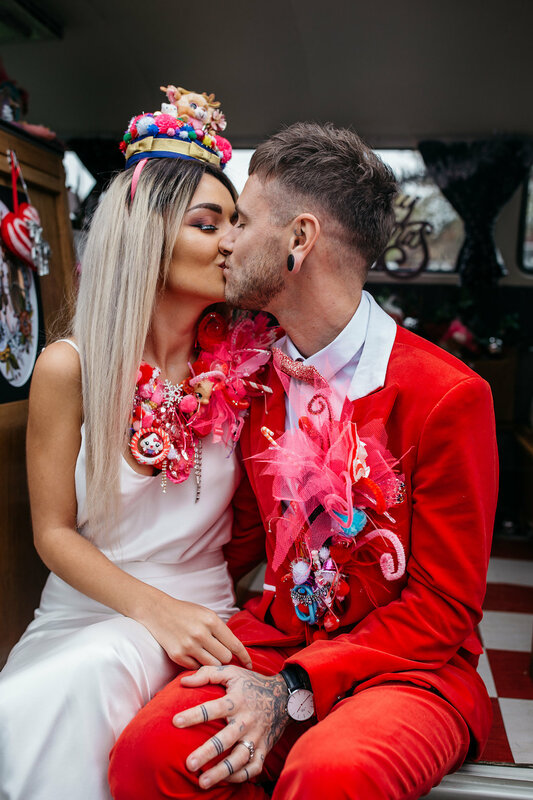 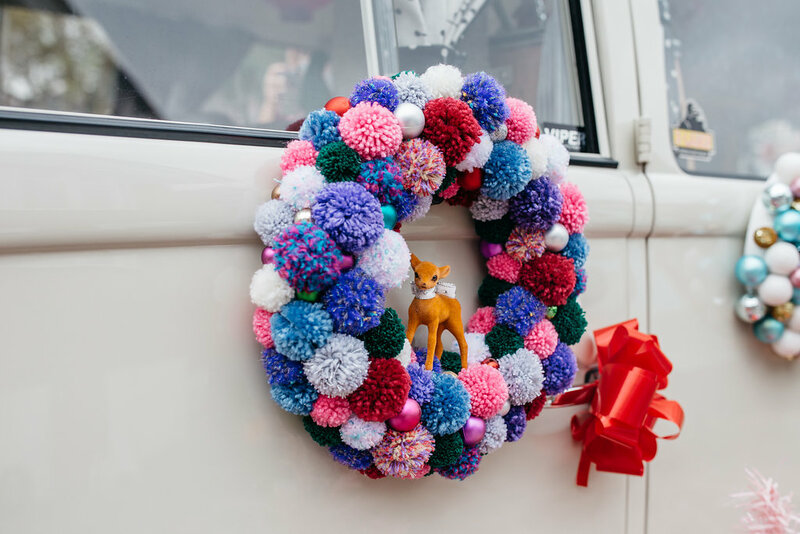 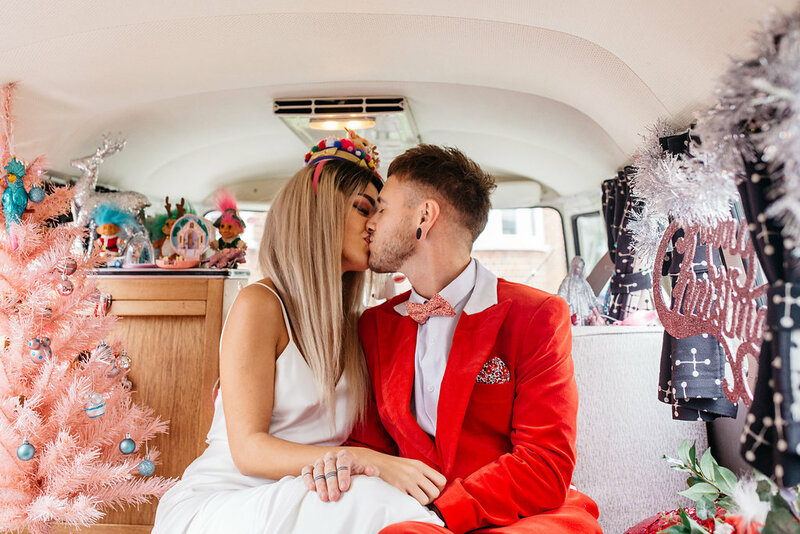 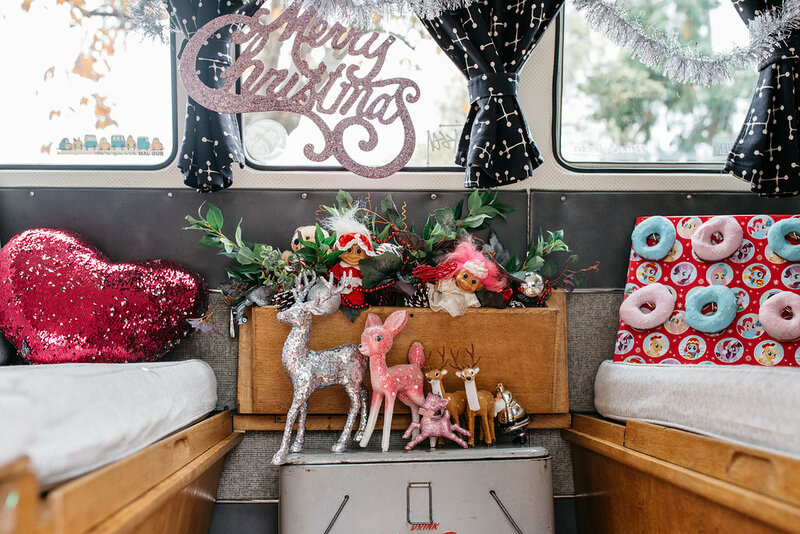 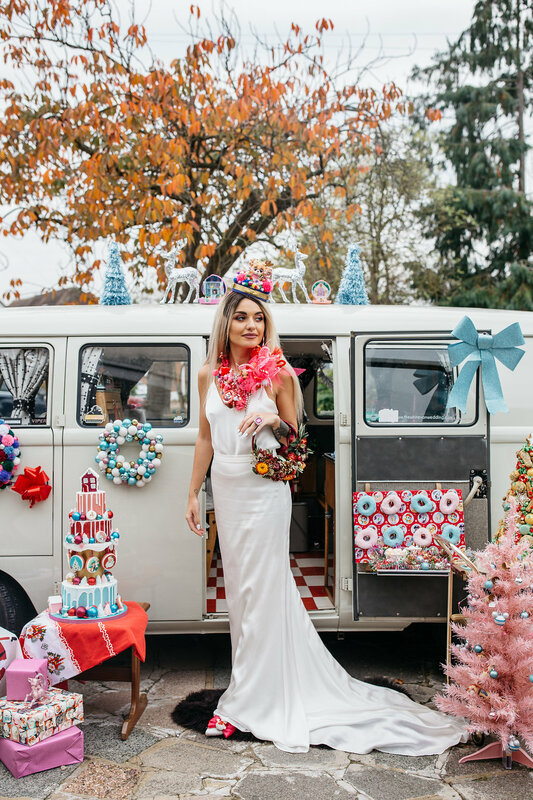 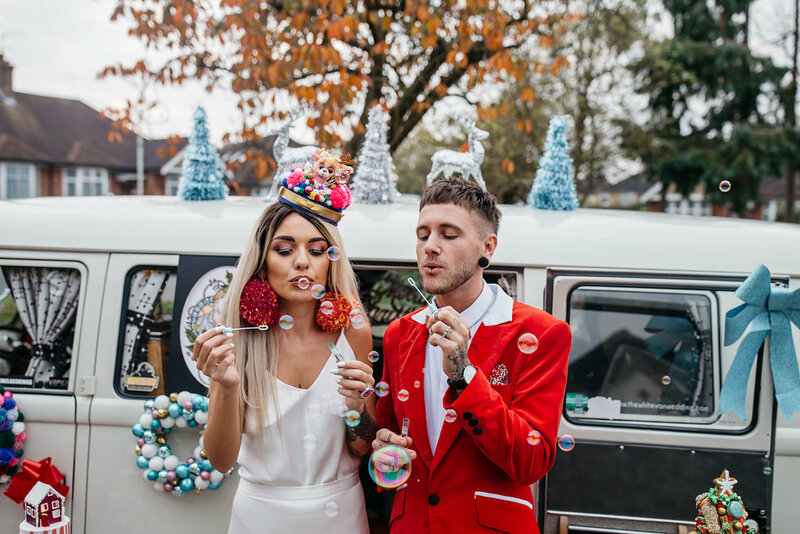 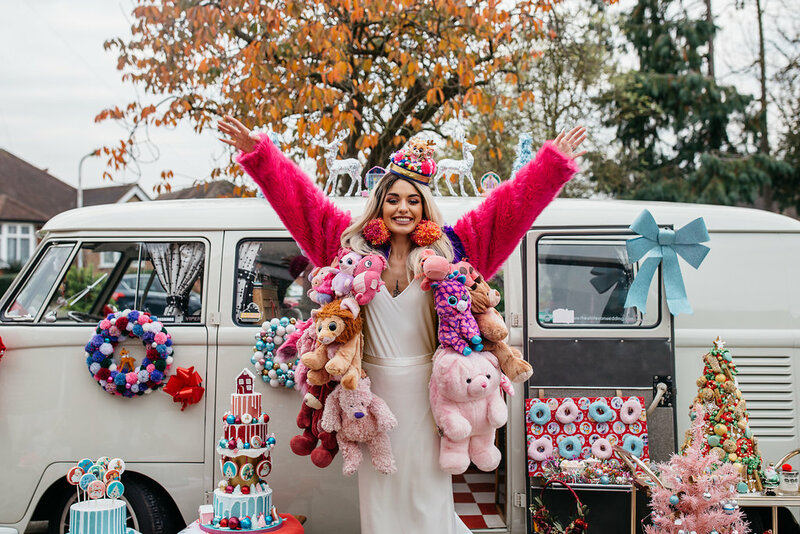 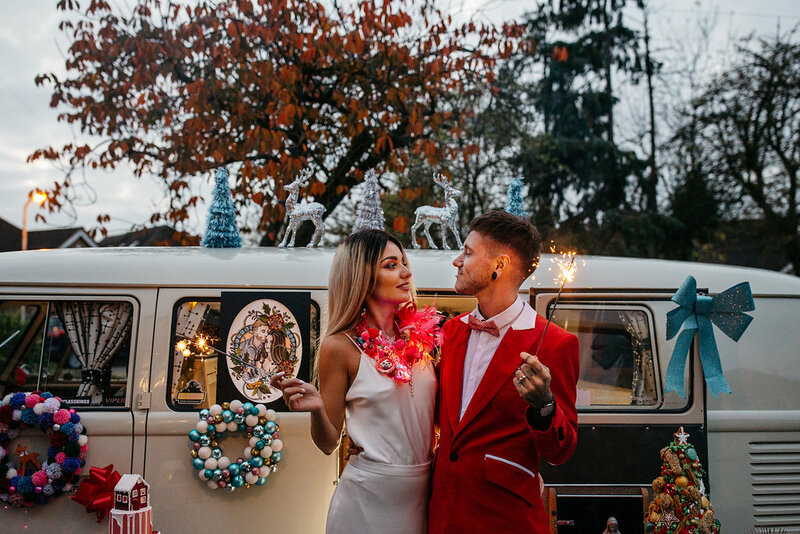 Today I am excited to share MERRY KITSCHMAS – A vibrant and colourful alternative Christmas Elopement inspiration shoot. 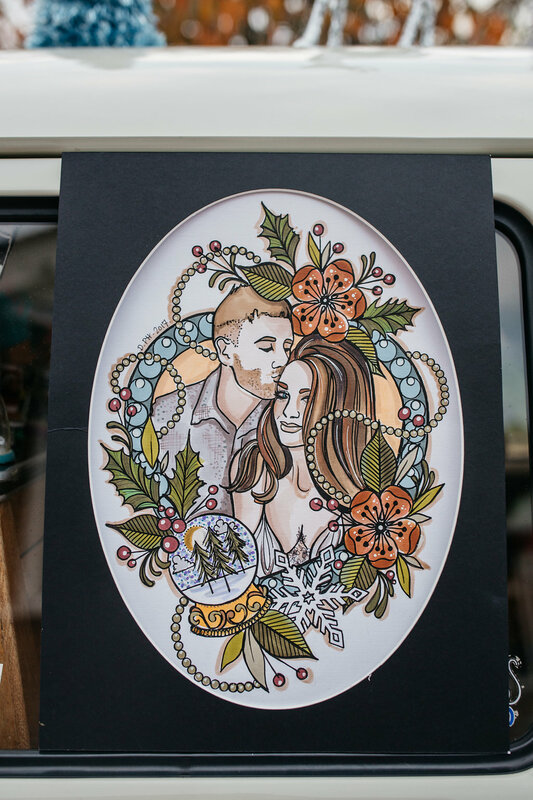 Images were captured by Chloe Lee Photography with the creativity of an incredible collaborative team. 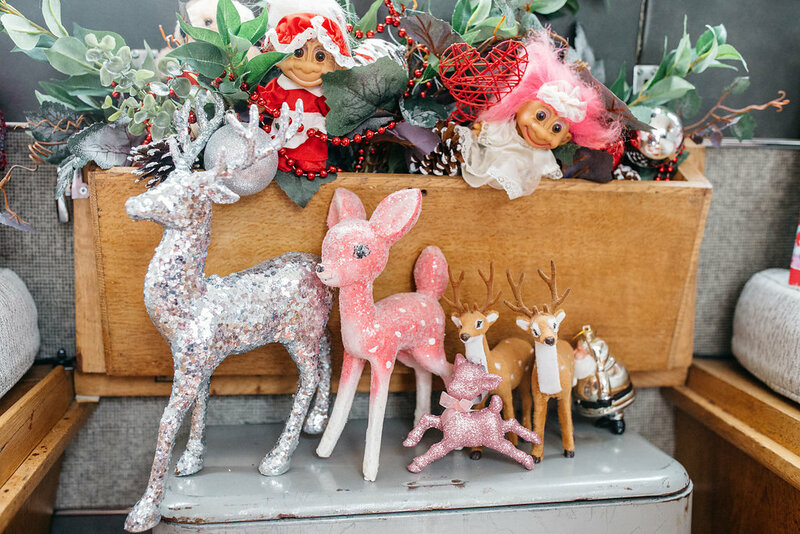 So in case you didn’t know, I LOVE Christmas – like really love Christmas, it’s totally my favourite time of the year! 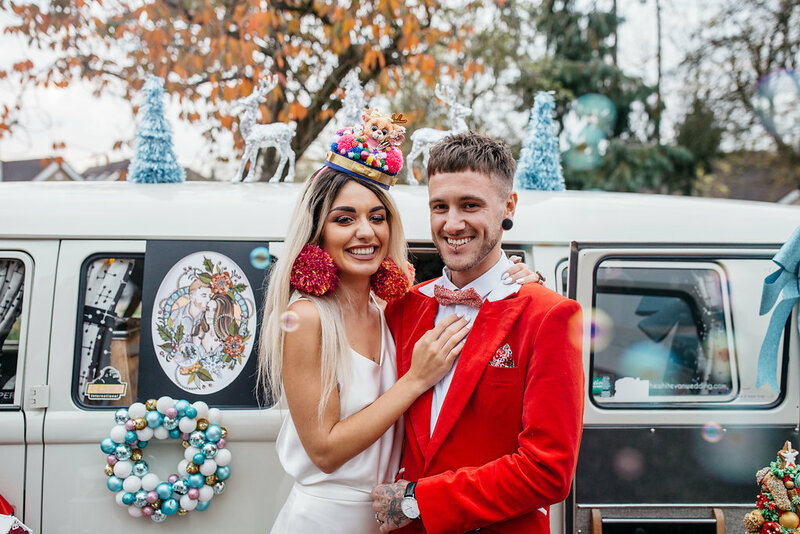 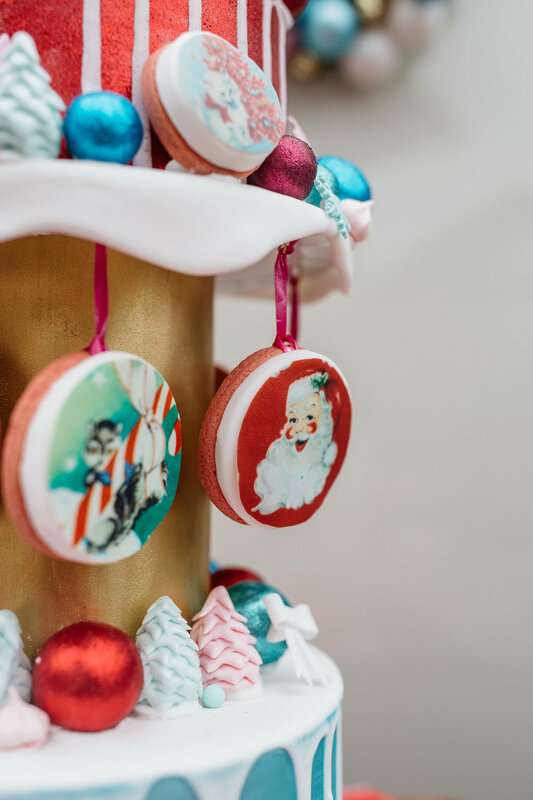 I also really love anything kitsch, retro and totally over the top SO what better than to combine those things to create a crazy Christmas inspiration shoot!? 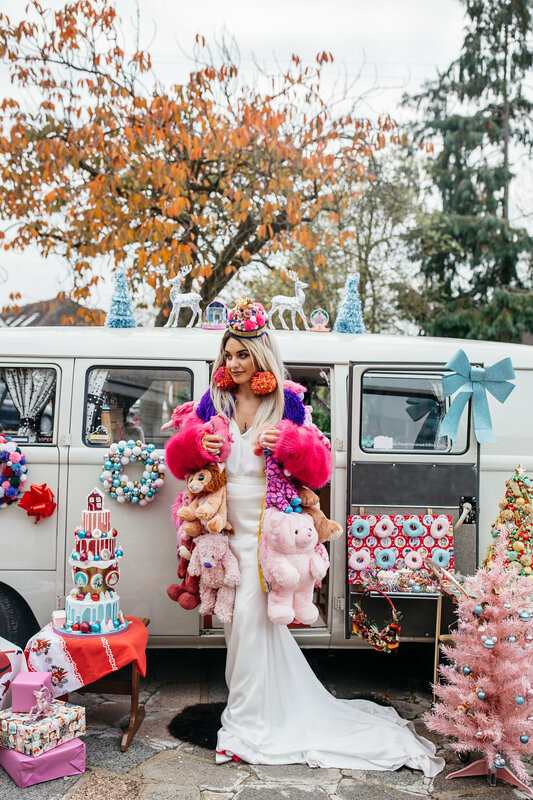 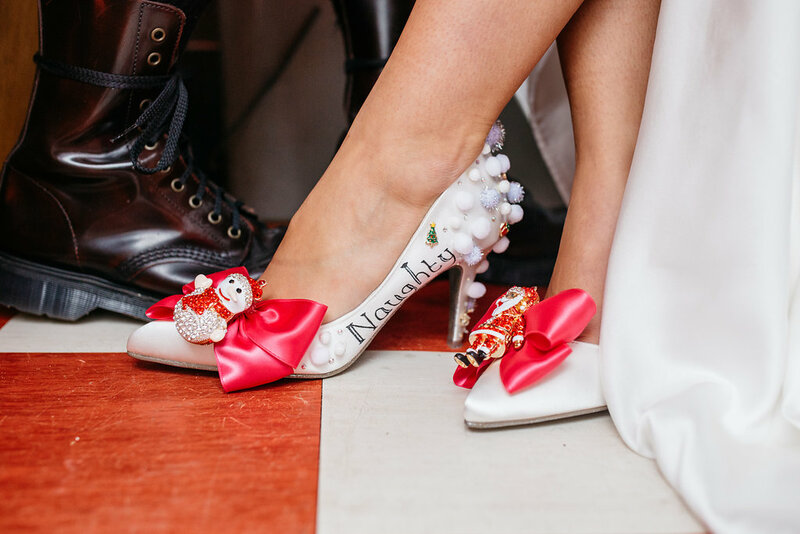 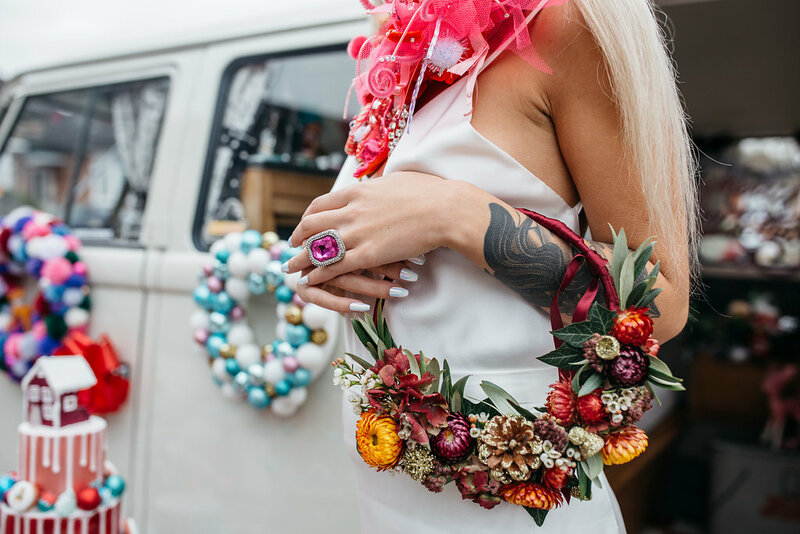 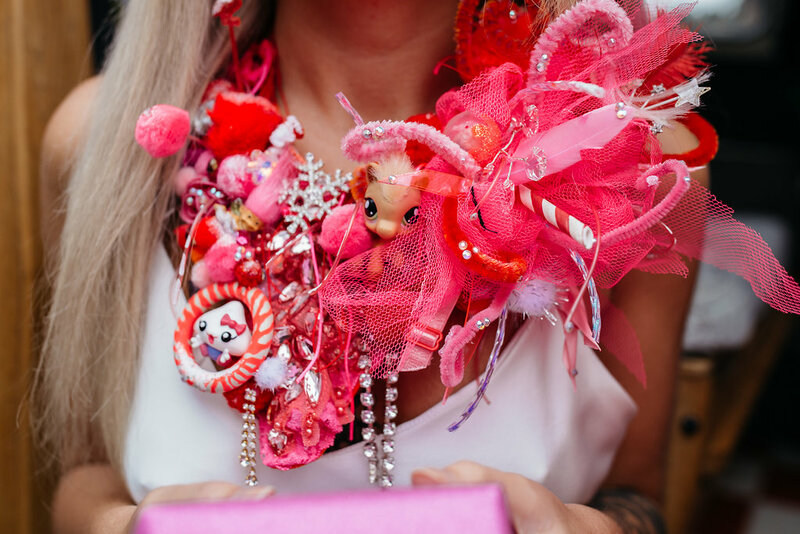 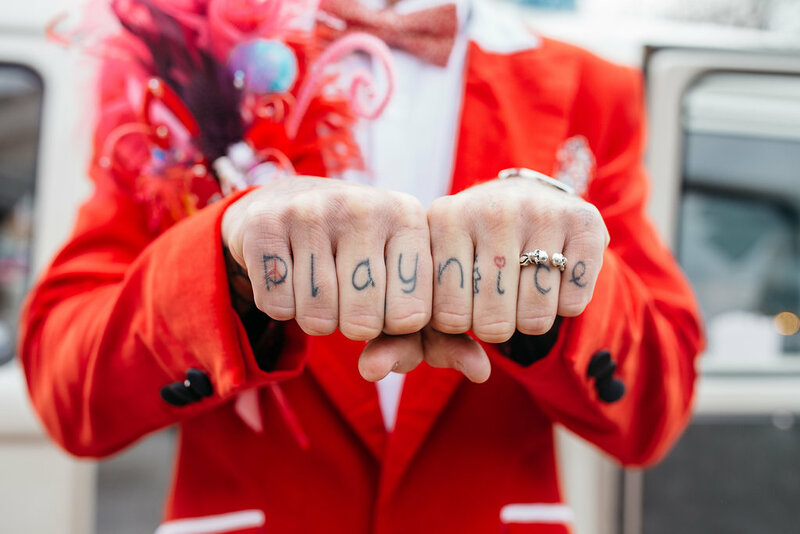 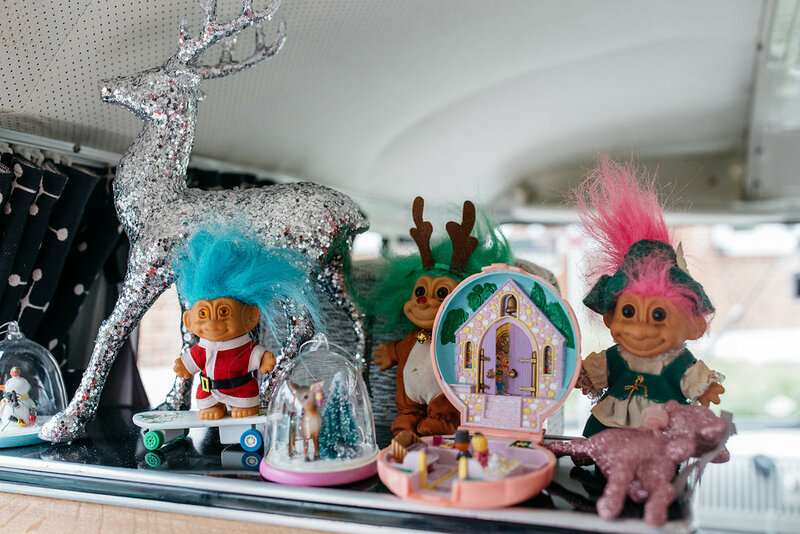 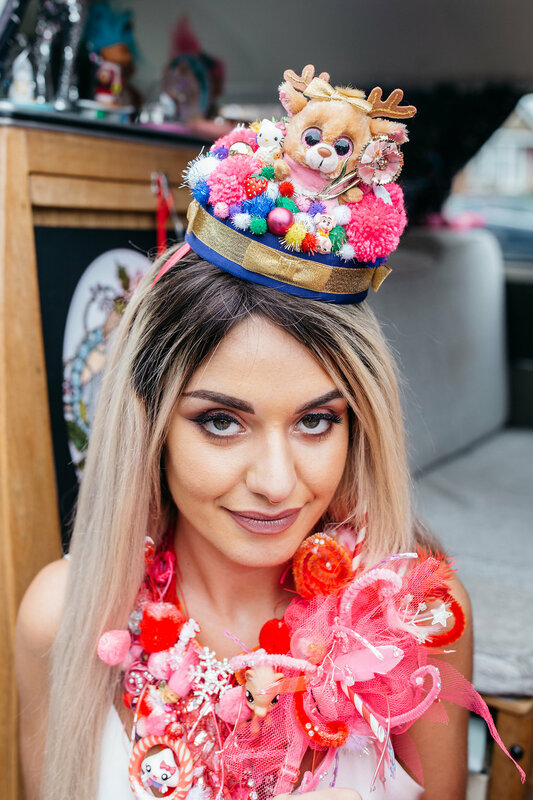 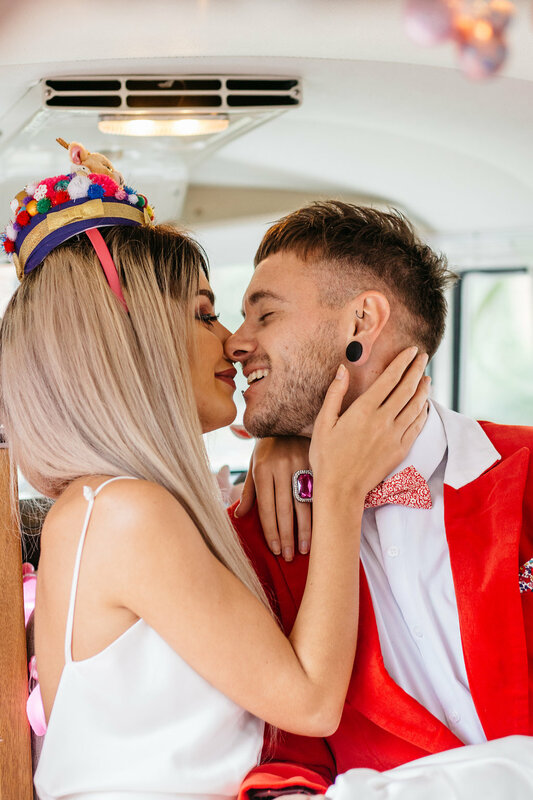 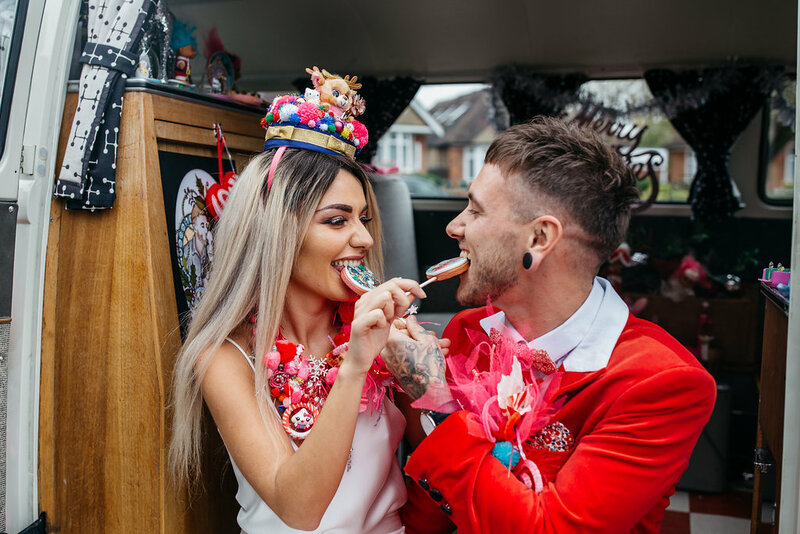 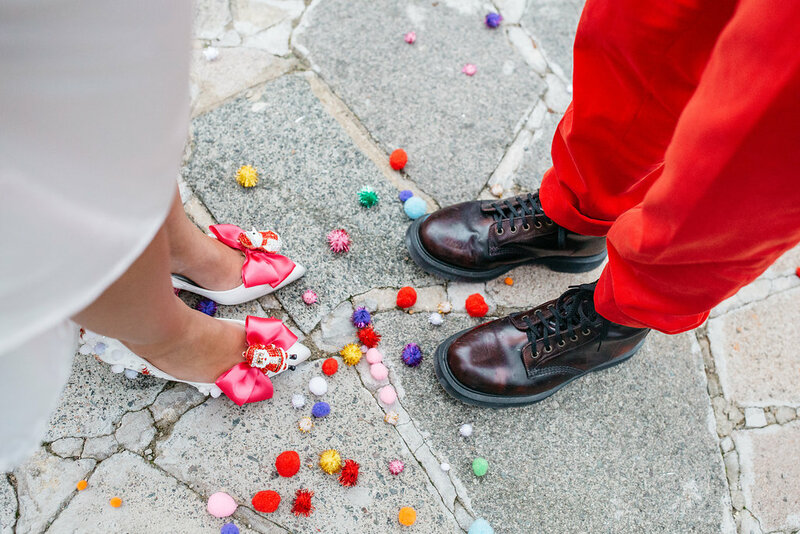 I joined forces with Michaela from Clear-Hearts who is a rock’n’roll wedding planner who shared my total love for an OTT, more is more style, paired with her love of Bjork and Paul Yore it had the perfect balance between crazy cool and cutesy kitsch! 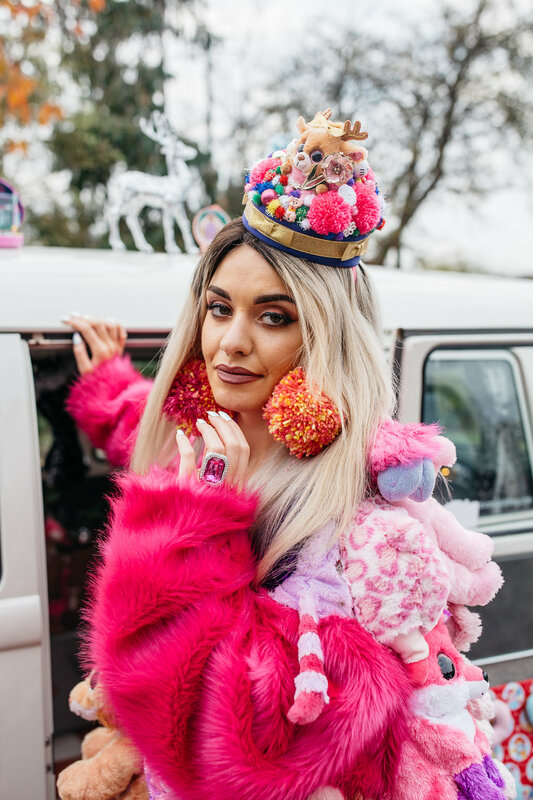 Kayleigh aka KayleighKMUA created the most beautiful of make up looks on our model Yasmin, with beautiful bright flawless skin and subtle pink smokey eye. 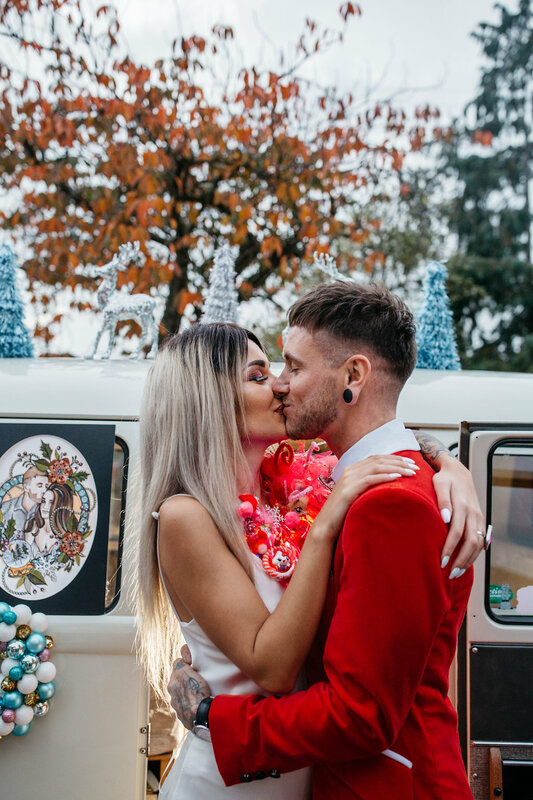 I was in the midst of finishing wedding season and lots of edits so Michaela really was the brains and leader behind the whole shoot – sourcing various awesome suppliers that really got and understood the vision we were trying to create. 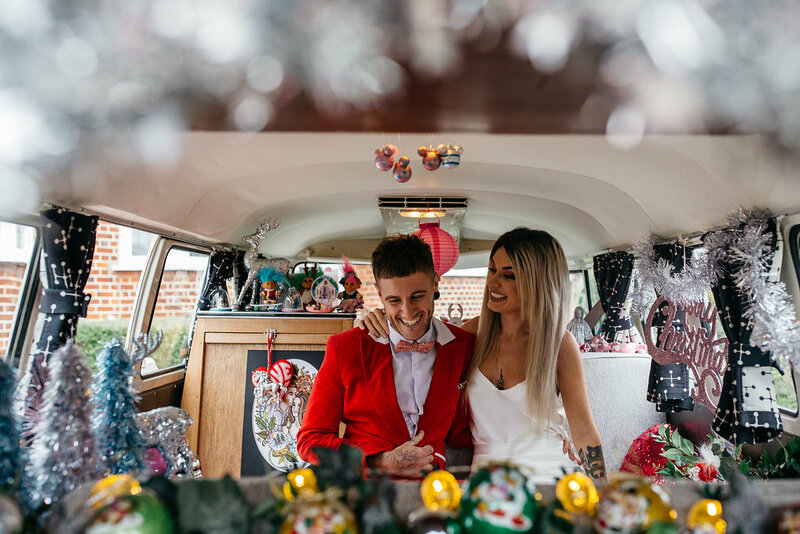 We wanted to use suppliers that were really open, inclusive and catered for couples that really want to do things their own way. 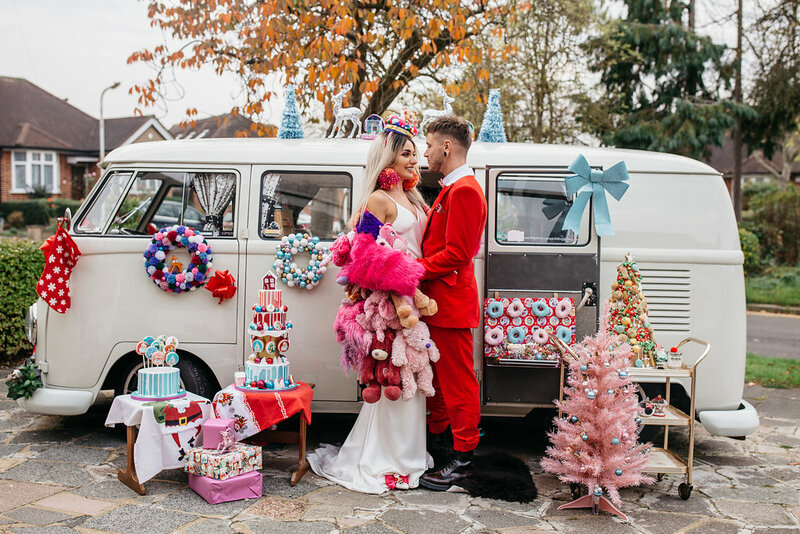 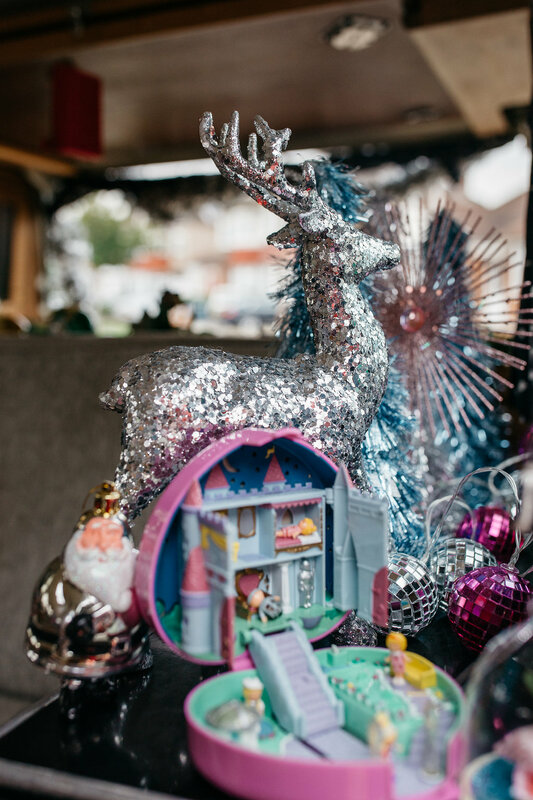 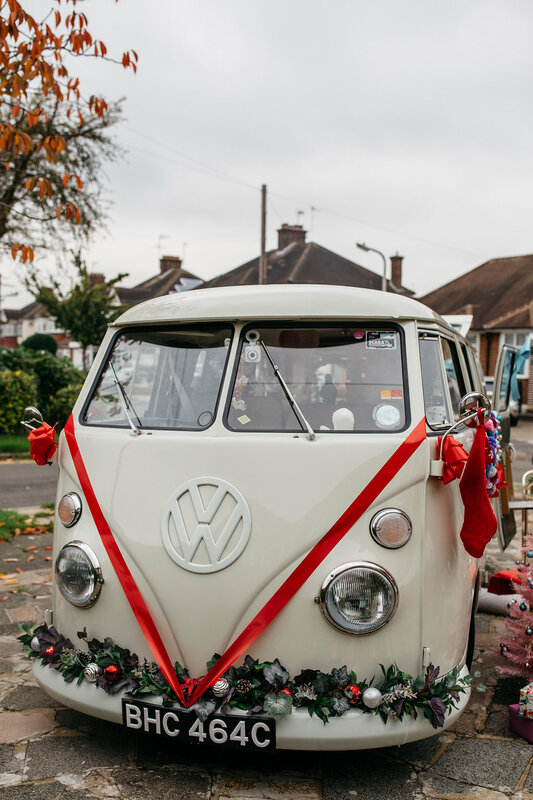 Lots of suppliers, myself included, brought along their own personal kitsch stash along to decorate the ‘venue’ which in this case was a super awesome white VW camper van from The White Van Wedding Co. 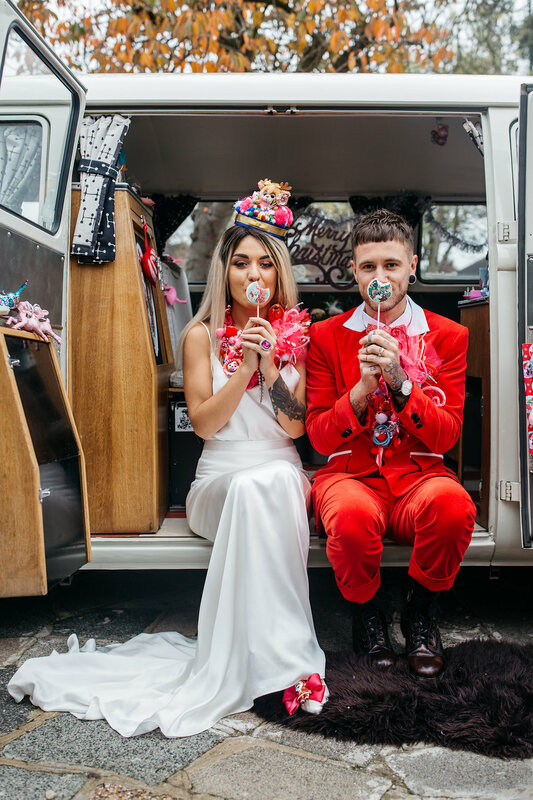 The idea was of an elopement of sorts and we wanted to fill the van with lots of fun stuff! 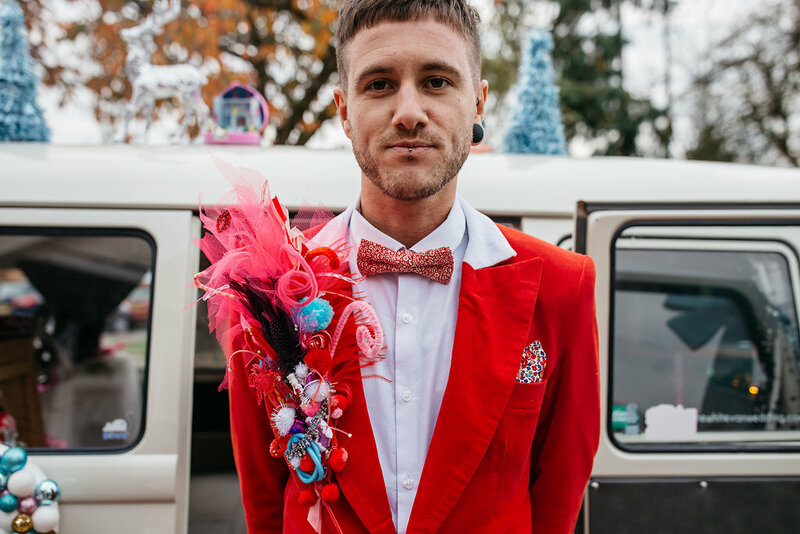 When it came to clothing & styling we had an abundance of cool brands to work with! 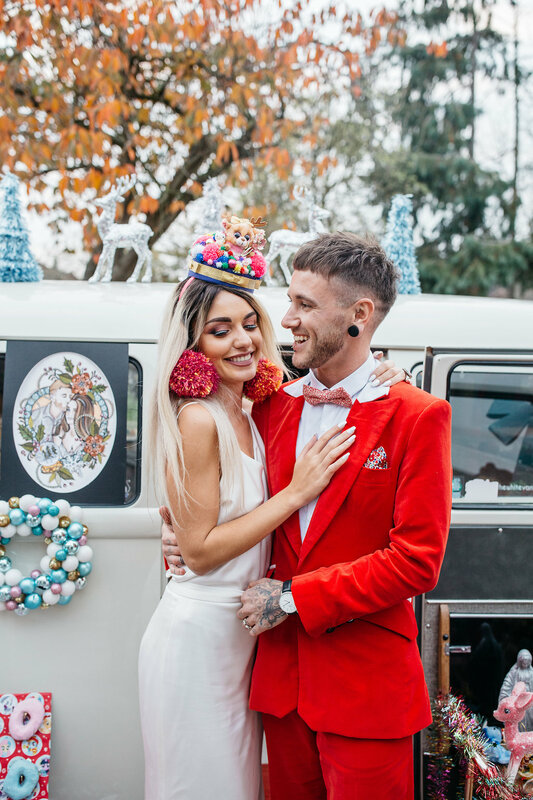 A super elegant 2 piece by Marquise Bridal from Halo & Wren Bridal, and and awesome red suit, perfect for our tattooed Santa from Karlus G Tailor. 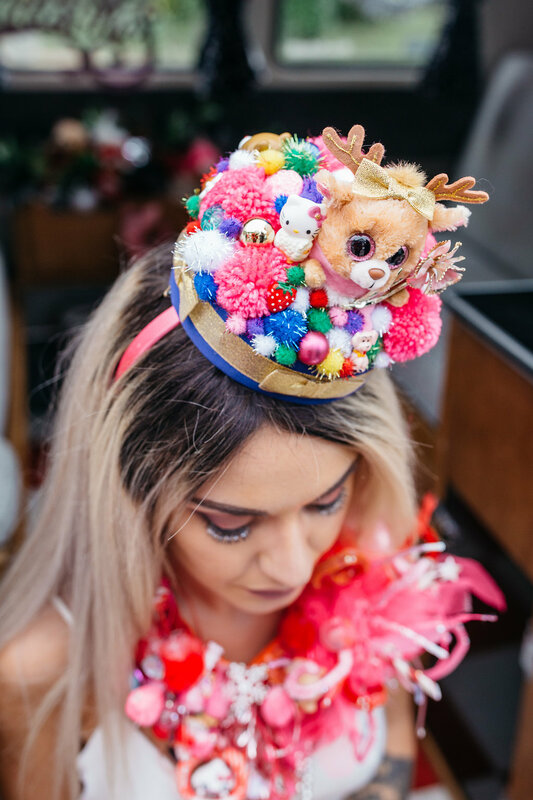 Accessories were provided in the form of an awesome hat by McFayden Millinery complete with pom poms, toy reindeer and Hello Kitty figurines. 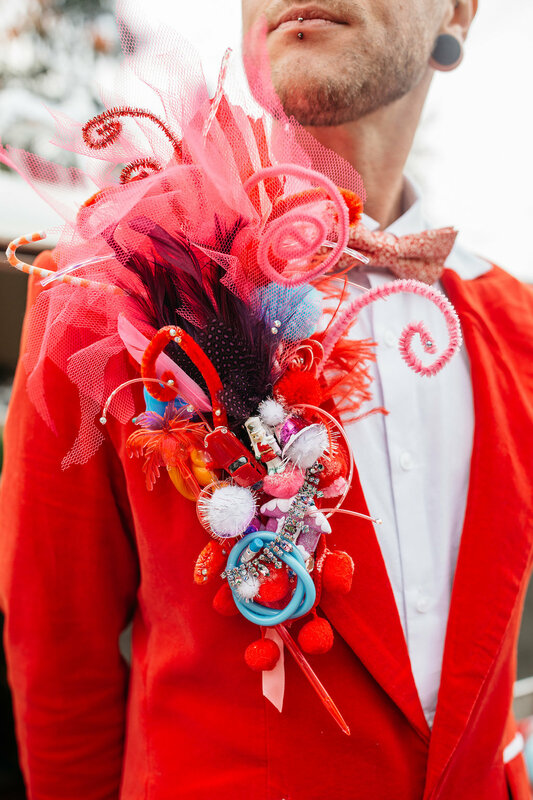 A truly amazing and bespoke necklace and lapel piece by Fway Lawn. 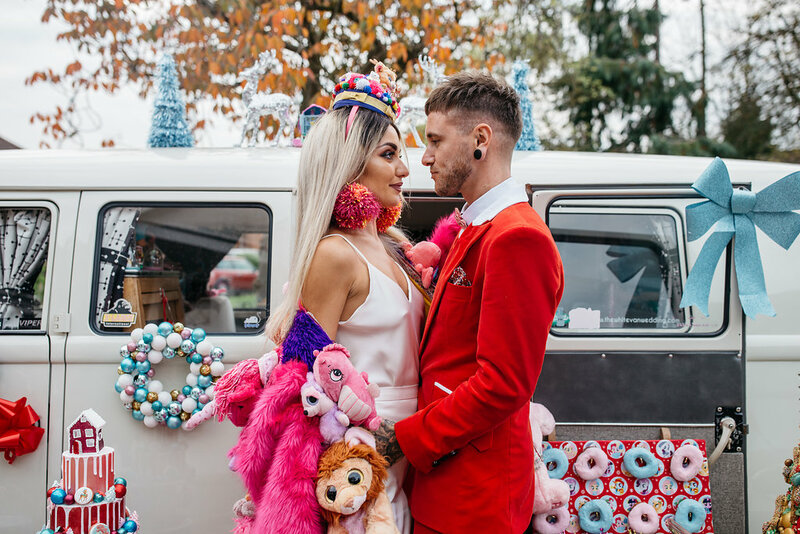 Giant pom pom earrings and THAT COAT by Sassy Freak. 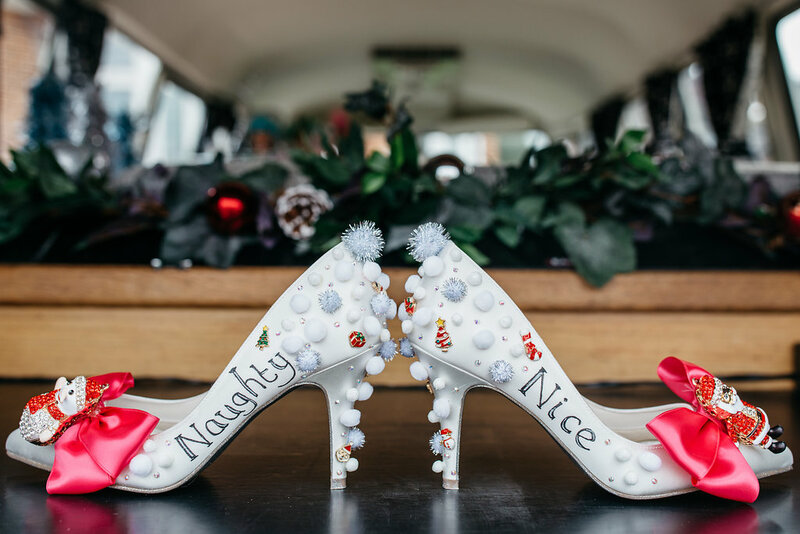 Naughty & Nice bespoke shoes by Beretun Design. 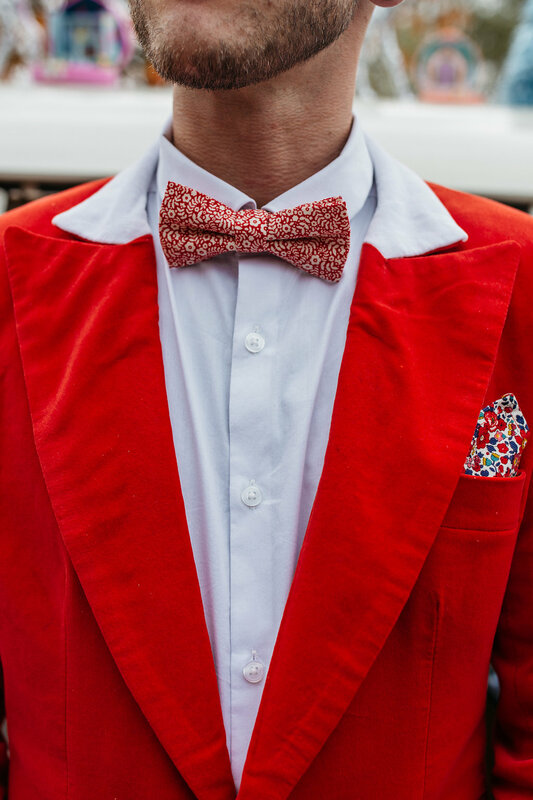 Quirky bow ties and pocket squares werefrom LV Made in England. 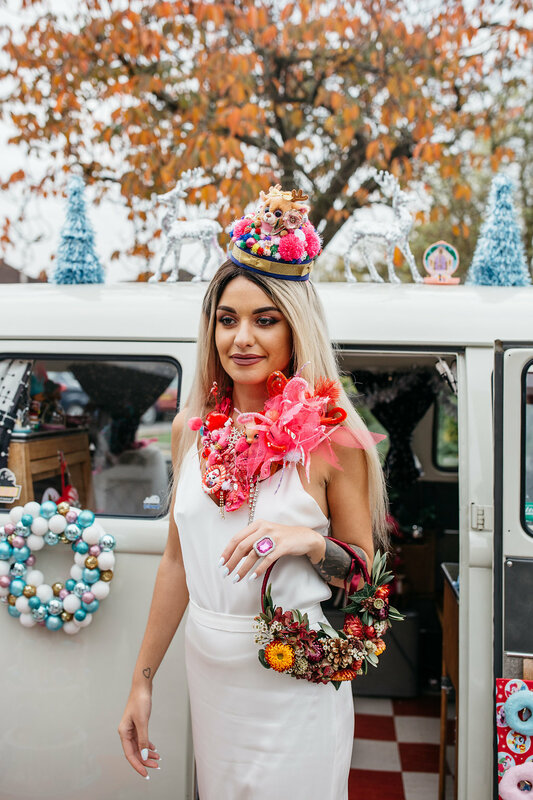 Wanting to stick with our ‘breaking the traditional wedding rules’ attitudes but also wanting a *hint* or traditional Christmas styling Sweet Pea and Rosa created us a beautiful wintery flower hoop complete with glittery pine cones. 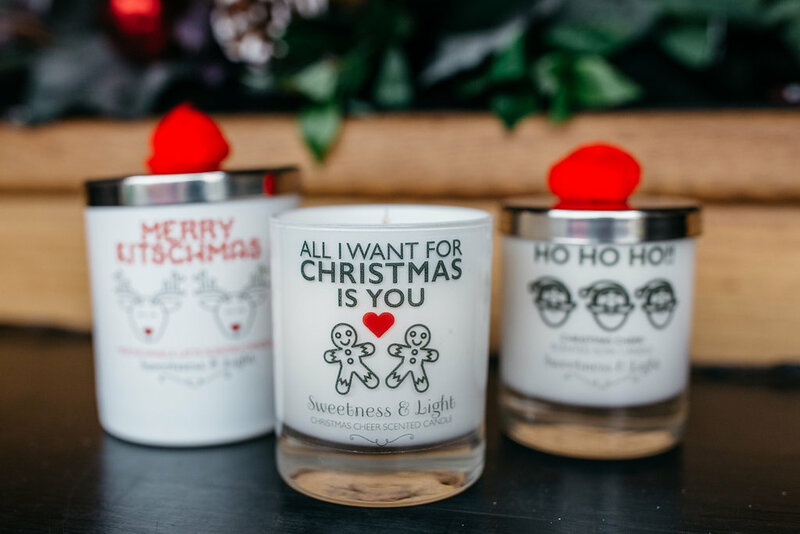 Christmas wouldn’t be Christmas without candles so Sweetness and Light provided us with a festive array of scents, plus just look at how cute the jars are too! 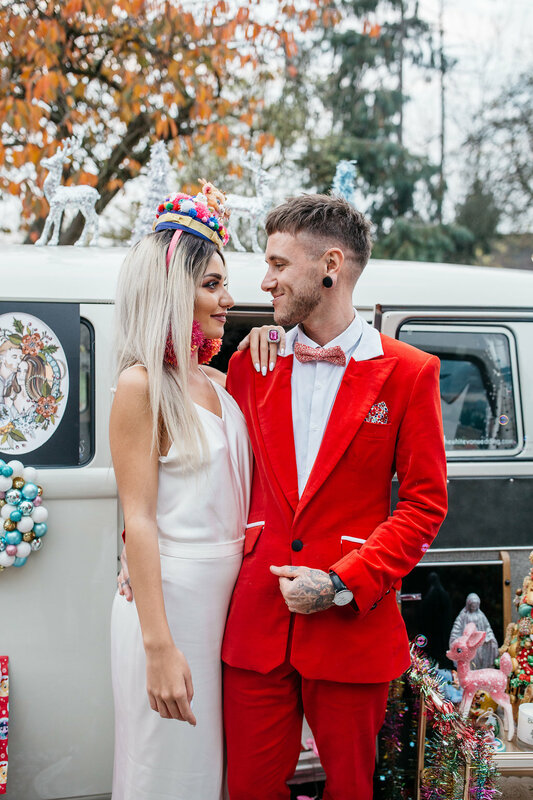 Our models were real life couple Yasmin, who is also a make up artist, and Chris who is an awesome tattooist! 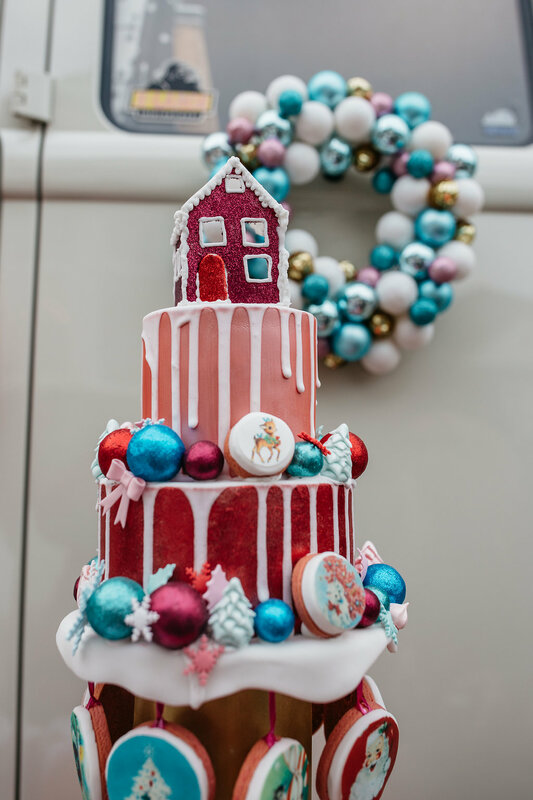 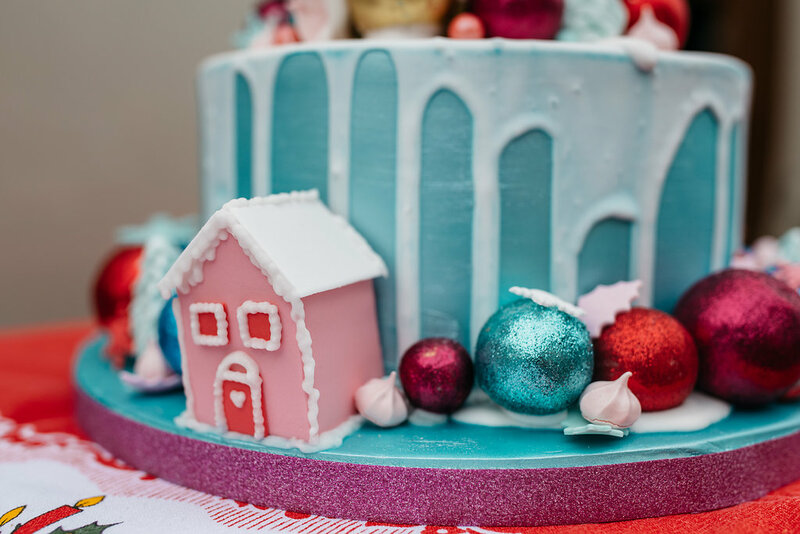 A cake with hanging, yes, HANGING biscuits, as well as mini glittery trees and a house on top complete with a light! 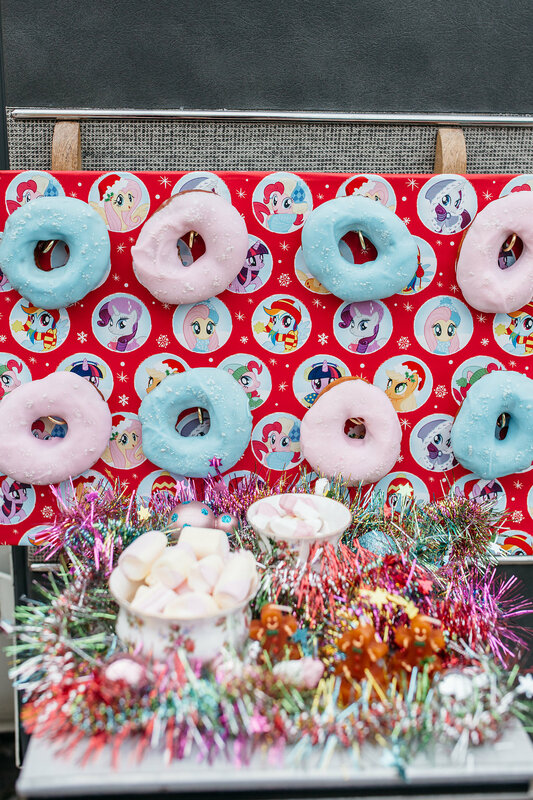 Katie also brought us a sparkly donut wall and some super kitsch biscuit pop, that I can confirm tasted delicious! 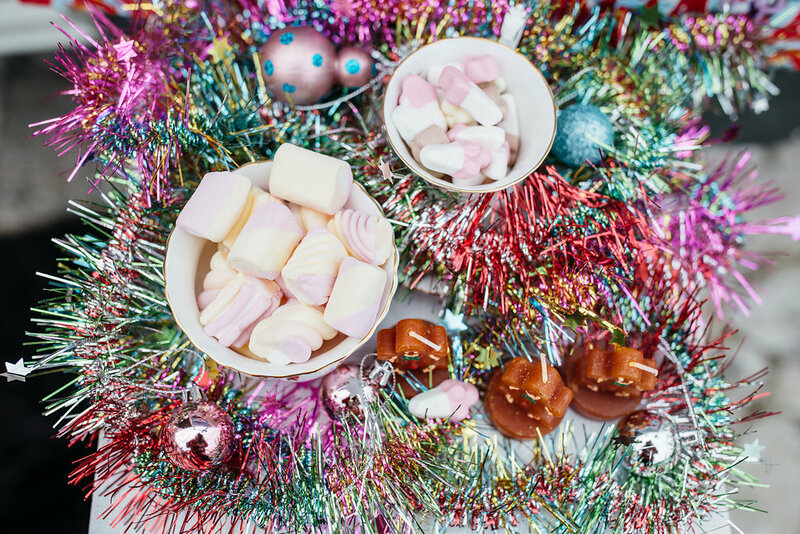 So much so that I actually put in an order for some myself after! 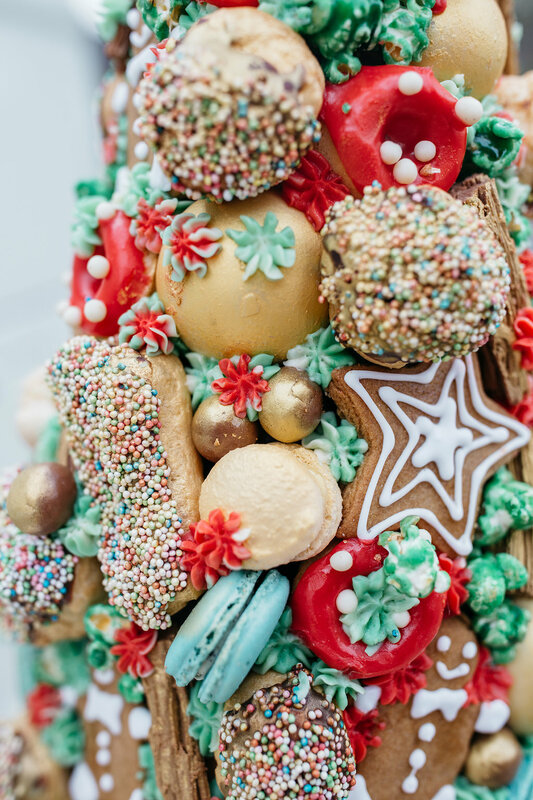 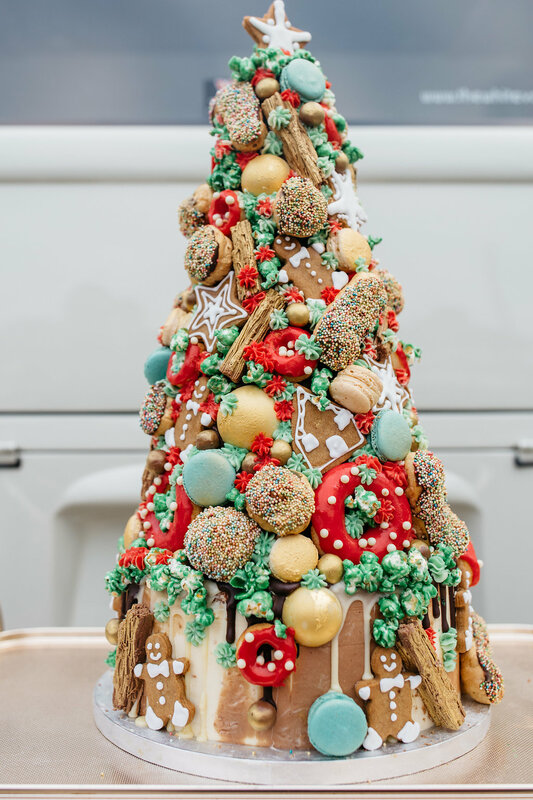 Ever since I watched an episode of the Great British Bake off a few years ago I have been obsessed with Croquembouche but only ever seen them at weddings in France, so when Anges de Sucre offered to make her famous Christmas Croquembouche cake I was SO excited and when I saw it in real life I was just blown away by how quirky and cool it was!